In his first address to Congress, our current President decided to offer his audience something more than just a view from the Oval Office: he conjured a view from heaven. Not a God’s eye view, though – Trump has a hard time talking about God – but the view from the eyes of a dead Navy SEAL, killed on a recent operation in Yemen, a raid which Trump had approved and that also resulted in the deaths of several civilians, including an eight-year old American girl. Never one to get bogged down with such gloomy details, the Commander-in-Chief focused on what he apparently decided was a positive: the SEAL, who had left behind a wife and multiple children, was nonetheless, per Trump, looking down “very happy” at receiving a supposedly record-breaking standing ovation. But not all views from Heaven are so rosy, or so grotesque. Writing in 1940, in a Europe set ablaze by a fascist worship of violence that Trump’s own militarism distressingly resembles, the German Jewish philosopher and critic Walter Benjamin imagined a very different view from above. 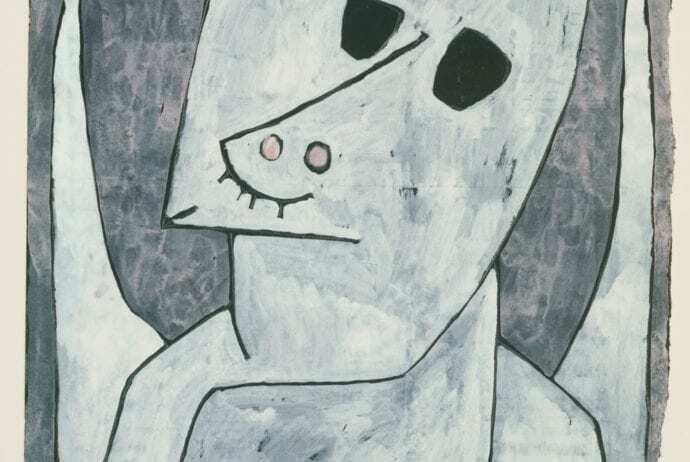 Two decades prior, Benjamin had acquired a small painting by the Swiss artist Paul Klee, a piece which became one of Benjamin’s most prized possessions, and which he kept hung in his office. 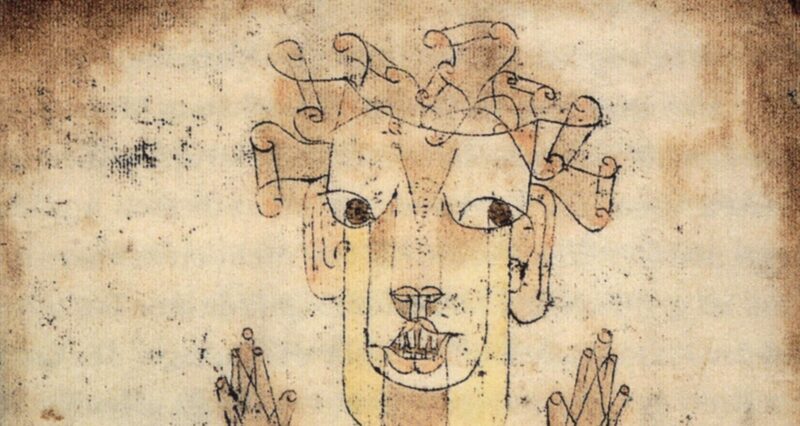 That year, the same year in which he would later commit suicide while fleeing the Nazis, Benjamin wrote about the painting in lines that would make the artwork famous. Benjamin’s ‘angel of history’ fills the double function implied by the Greek word angelos, at once a witness and a messenger, reporting to us the message of what it is that it sees. Its message is brutal: where we perceive discrete events and causal relationships, the angel sees only a continuous churn of disaster. Conceptual distinctions and postulated narratives paper over one giant wound, a trauma. To paraphrase and extrapolate from Tolstoy’s famous observation: Perhaps every happy era is the same and all of the miserable ones are different in their own horrific ways. Benjamin’s vision of the view from above seems entirely appropriate for a hunted man living in a time when one global war, the Great War, the supposed War to End All Wars, had bled so rapidly into yet another. And now, in our contemporary moment, we may all arguably have our own, different reasons for thinking that Progress is a kind of lie – Fake News about the Fakeness of the New, if you will. One thing is certain: we need perspective, not from mystical angels or the apostrophized dead, but from more flesh-and-blood witnesses and reporters. Now is a time of many traumas, to be sure. But for many people, this is hardly news, and where some may perceive new developments, others recognize a continuation of catastrophes with which they have struggled for years. Against this backdrop, then, and in search of perspective to better understanding the suffering around us, we must ask difficult questions about testimony, authority, victimhood, complicity, and vulnerability. What authorizes, credentializes, or otherwise justifies telling the story of another individual’s trauma? Who can speak for whom – particularly across fraught categories of gender, race, religion, and nationality? What responsibilities, risks, and rewards come with such work? How might religion inform this enterprise, both for the people who undertake it, and for those whom they address? To explore these questions and more, NYU’s Center for Religion and Media, in partnership with the Center for the Study of Gender and Sexuality and the Religious Studies Program, will be holding a public panel bring together academic, therapeutic, and journalistic perspectives on trauma. 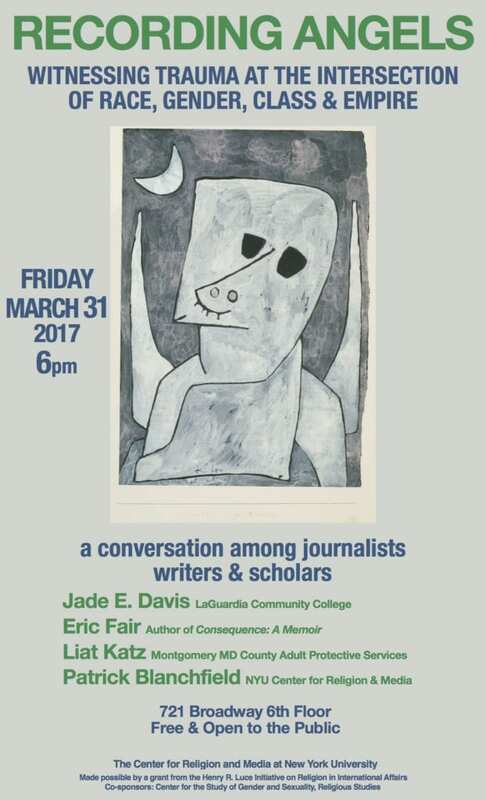 Our three panelists – Jade Davis, Eric Fair, and Liatz Katz – are each brilliant writers who have publicly tackled traumatic subjects and, in different ways, the subject of trauma itself. On the evening of March 31st we’ll gather to talk about their work, about representations of trauma in our current moment, and more. Our goal will be to cultivate a perspective on suffering that is not just from above, but firmly anchored on the ground as well. Please join us, and share your perspective as well.